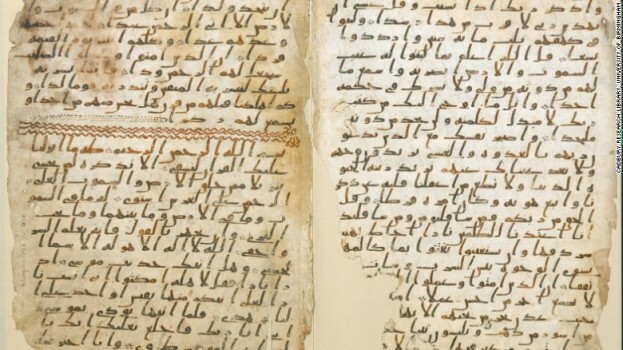 For years, the two parchment leaves covered in an elegant early form of Arabic script were misbound with leaves of a similar Quran manuscript dating from the late seventh century. Now, with the help of radiocarbon analysis, the two fragments have been shown to be decades older — which puts them among the oldest known examples in the world, according to researchers at the UK’s University of Birmingham. The testing, which is more than 95% accurate, has dated the parchment on which the text is written to between 568 and 645 AD, the researchers said. This means it was created close to the time of the Prophet Mohammed, who is generally thought to have lived between AD 570 and 632 AD, they said. The ancient fragment is part of the university’s Mingana Collection of Middle Eastern manuscripts, held in the Cadbury Reseach Library. They were gathered in the 1920s by Alphonse Mingana, a Chaldean priest who was born near Mosul, Iraq, but settled in England. The two parchment leaves are believed to contain parts of Suras (chapters) 18 to 20, written with ink in an early form of Arabic script known as Hijazi. And according to Professor David Thomas, professor of Christianity and Islam, the text is very similar to what is found in the present day Quran. “This tends to support the view that the Quran that we now have is more or less very close indeed to the Quran as it was brought together in the early years of Islam,” he said.